While most would likely attribute the “Minneapolis Miracle” (final play against the New Orleans Saints that advanced the Vikings in the NFL playoffs) to bolstering Keenum to NFL fame, he and his wife knew exactly who led them there—God. With his new book “Playing for More,” released Sept. 4, Keenum talked about how his NFL career is in God’s hands. It’s a story that goes all the way back to a West Texas community and a local Fellowship of Christian Athletes (FCA) office. Keenum’s father, Steve, a former football coach and the current FCA director in Abeline, Texas, instilled in him early on the importance of God, hard work and faith. 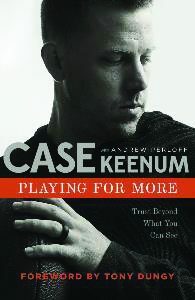 Keenum’s book ‘Playing for More’ was released Sept. 4. Thanks to their influence, Keenum gave his life to Christ. His junior year, he noticed a girl who attended a different high school from him who also served as an FCA leader. Case and Kimberly started dating and eventually wound up at the University of Houston together, marrying in 2011. Keenum said his faith became real in college. He was used to success in high school, but then things got harder. As Keenum has become more widely known, he’s made sure that his relationship with Jesus is part of his story. And, he’s found he’s not alone. 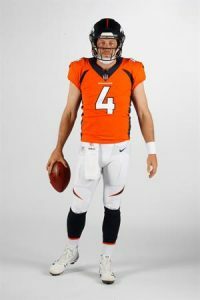 Keenum is preparing to pass it on as he readies himself to play on a new team. He recently signed a two-year contract with the Denver Broncos, but he’s also passing on encouragement through Christian sports. His story continues to be shared in “Playing for More,” which tells how God has been faithful through good times and bad.